The Four Crowns is a simple four patch with one of my favourite "features" -- that being, it is designed in a directional format. I like these types of blocks because you can create numerous arrangements by using 90 degree rotations of some of the blocks. I generally group four blocks together in a "chunk". You can create all sorts of interesting outcomes because secondary designs start to emerge. The block is created entirely of half square triangles, in two different sizes. 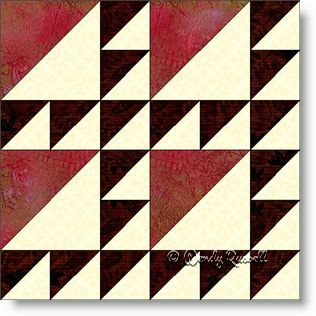 If you look closely at the sample quilts you will see that I have used this format of rotating many blocks, in both of the quilts but in different ways. There is no limit to what you can do!